The Climate Chronicles: Whoa, what's this? Hoosiers believe climate change is real! Whoa, what's this? Hoosiers believe climate change is real! 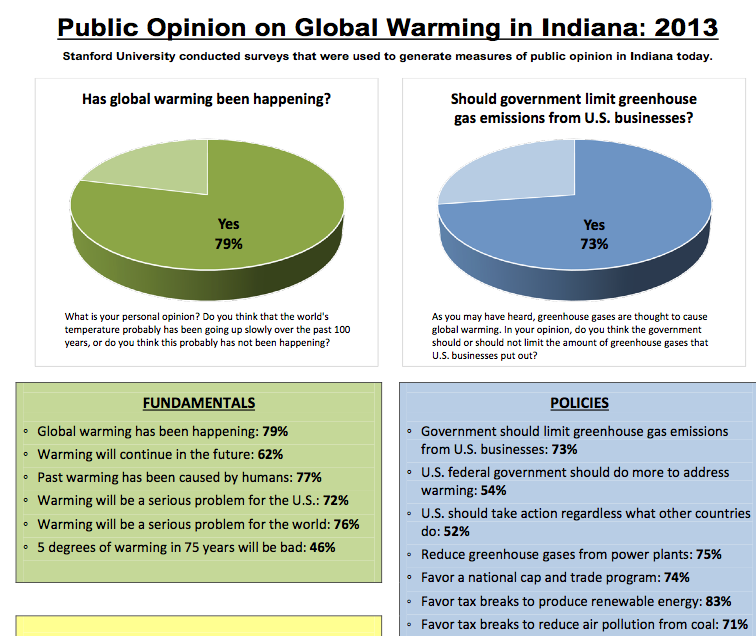 Here's a screen shot from a Stanford poll that reflect Hoosier's belief that climate change is real. Pretty awesome fodder for our ongoing discussions with the "skeptics" and "deniers." Turns out they are in the minority, tho of course there is much to disagree about otherwise. Still, if we can agree on the basic science, our differences have a basis in reality. You can check out the study here. And then dig deeper on Indiana's perspective, along with 45 other states.